As a result of the warming of the earth caused by the change in climate, the world's desert regions are spreading; accordingly, the undemanding camel will become increasingly important as livestock. Every year our planet is losing fertile farmland in dimensions of Germany by erosion: Over-fertilizing and concrete sealing on top of it. Modern agricultural technique is in great demand. The author's attention was first drawn to the camel as livestock in 1947 by a student who participated in the basic lab course in Biochemistry: This Arab student had brought camel's milk and wanted to compare it with cow's milk (and mother's milk), i.e. conduct the experiments offered in the lab course also with camel's milk. The author granted this request and allowed the student to carry out such experiments under his supervision outside the regular course; cf. Part V-A, p 130/1. The vitamin C content of camel's milk was unexpectedly high (3 times higher than that of cow's milk). During the time of the BSE-crisis, we examined to what extent camel placenta extract can replace placenta extract of other mammals (pig, cow). See Tab.2, published in the "International Electronic Journal on Dermopharmacologica, Technology and Related Cormeric Subjects": http://www.vevey.com/relata. Since 1965 the author realized the successful application of several protein free (and enzyme free) cosmetic additives like OMNITHYMUS, k-PFE + CELLRYL in EVANGYL (POLA). See Part V-B, also in Part II, p 305 - 320. For the preparation of Camel collagen (freeze dried or in solution) see the prescriptions, given for cow collagens in Part V-B, p 825ff. Preparation: After the removal of blood, flesh and fat, the camel skin was comminuted in a grinder and then used for the preparation of camel collagen which is soluble in neutral salts / acid. We have stored collagens in the freeze-dried state since 1947 and also as a solution since 1975. 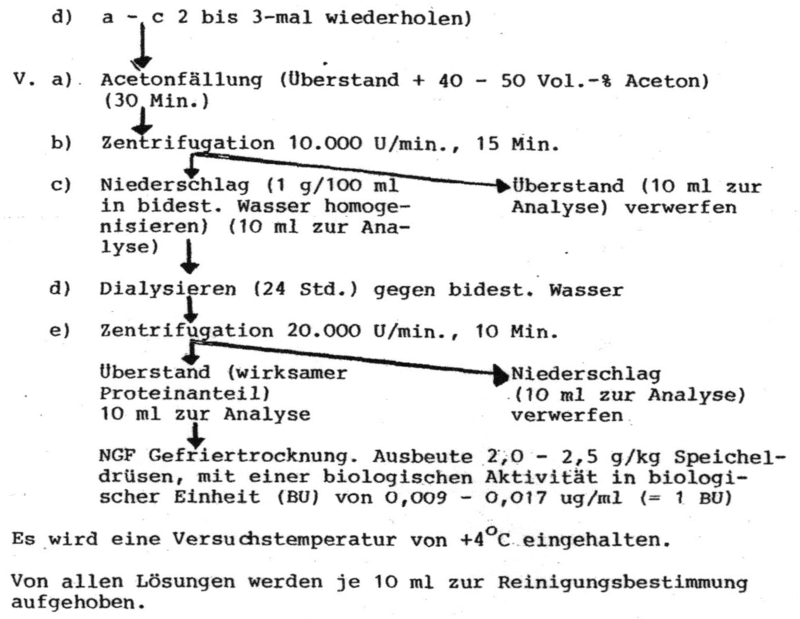 The next step was the addition of a preserving agent: described in greater detail and new at the time: V-B, p. 900-907; lecture of 29 January 1977 in Basle: Dtsch. Apotheker-Ztg.117, 1557-1562 (1977). In case of camel collagen, sorbic acid was used as a preservative; also cf. V-A, p. 863. Upon request, sufficient quantities of freeze-dried camel collagen were provided to the following partners: Wolfgang Seidel for his industrial enterprises - POLA, Japan - and Dr. Olivar, SCHERING AG, Berlin. a) One of very interesting observations regards a young camel with nutritional difficulties (bad eater); this animal began to eat after two weeks Y 2000 application (0,2%) and had to be stopped after two months because increasing weight (becoming a kind of over eater). The same result was also observed with a foal in Germany: Part II, p 575.
b) Appearance of all camels having received Y 2000: being good and well looking, like the chickens of Yamakawa: Part II, p 550, last paragraph and like the chickens of Max, see Part V-A, p 894. The sheikh was enthusiastic. - The author authorized Mariano to supply his Arabic friend in future with the help of our industrial friends Wolfgang Seidel, Faria and Dr. Pesserl, instructed by the author, the only inventor of Y 20-/Y2000-preparations, cf. Part II, p 545, 541.
c) Camels bred for racing are something very special. In countries of which camels are native they are generally regarded as being more than just livestock. (As far as camels as fatstock and their feeding are concerned, we will report in PROJ. XXVII as soon as we have gained sufficient experience of our own; that also includes the "topic of camel meat in the kitchen"). Camels are treated with great care: This is shown from the attitude of a camel driver vis-à-vis his animals who, for example, equip their she-camels with a kind of brassiere during milking. Load-bearing animals in desert regions are essential, but, as the author learnt when speaking with camel drivers, care is taken to avoid overloading. - This makes you pensive when recalling how livestock such as cattle, pigs, chickens and geese are treated in our country, not to mention factory farming. However, the demand must obviously be satisfied (?). d) Meat alternatives are in demand: protein-rich, cholesterine-free (-poor) products like 1) Tofu, soja-based, 2) Quorn, mould-based, 3) Mixtures of vegetable protein material, prepared in the Fraunhofer-Institut, 4) Culture-meat: cultivating muscle meat cells resulting in flesh with fibers - an expensive procedure, being still in its infancy. Taste: 2) and 3) better than 1), 4) probably best, but not yet tested. The author is collecting more information to 3) and 4) for PROJ. XXVII. The detailed description in English belonging to this scheme is found in Part V-B, p 1107. So as to be able to conduct the biological characterisation of the active protein from the extraction solution up to the purified and dried form methodically, we have modified the biological test developed by Levi-Montalcini to suit our experimental conditions. Mixture of reagents: 1 part of bovine serum, 1/4 part of Eagle's culture medium, 1/4 part of LE medium, 1/4 part glucose, 1 3/4 parts of NGF solution (NGF concentration: 1 mg/ml) for the experimental cultures and, respectively, 1 3/4 parts of 0.9 % NaCl solution for the control cultures. For the culture feedstock, one piece each of spinal marrow or brain was placed on a glass cover and 25 μl of the reagent mix of the culture medium with the NGF for the experimental cultures and without NGF for the control cultures were added. 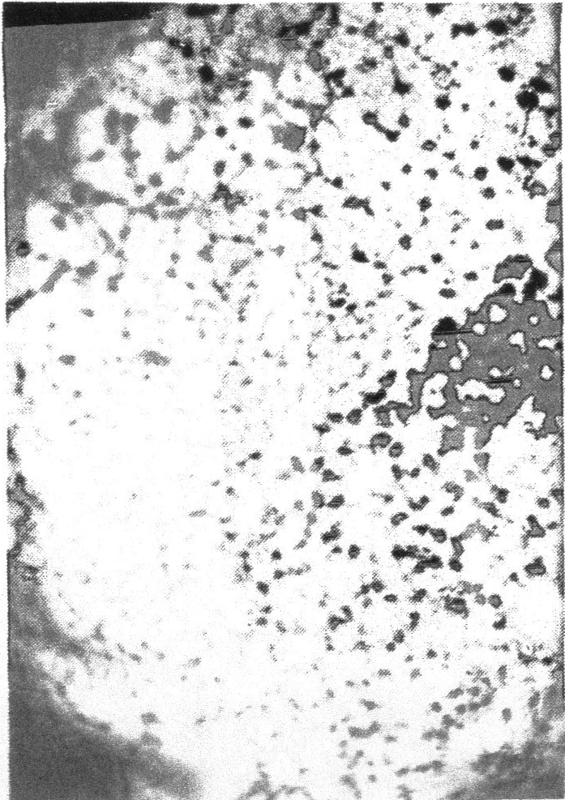 After stirring, the glass cover was glued to a microscopic slide with hollow grinding with the aid of vaseline. Then the glass cover was surrounded with a mixture of wax and paraffin so that the cultures were in an enclosed space. The cultures were placed into a breeding cabinet and analysed after the specified incubation time (indicated accordingly): Examples: 2 photographs. The NGF growth method according to R. Montalcini, R. Meyer, V. Hamburger described above which we modified is inadequate and requires improvement (by a competent biologist): there were errors in the separation and isolation of the nerve tissues from other tissue types, the analysis by the halo effect strength is superficial, many photographs must be taken and then selected, i.e. this method does not permit objective analysis of the nerve growth induction. The fact alone that the tissue culture grows in the three-dimensional space and photographs must be taken two-dimensionally makes documentation difficult: The following photographs were the "best of approx. 38" -- Quote by Montalcini in: Cancer Research 14, 49 ff (1954). -- However, better this method than none at all! in einer Endkonzentration von 0,85ug/ml. Testobjekt: Rückenmark von 8 Tage alten Hühnerembryonen. Inkubationszeit: 12 Stdn. Two illustrations (Fig 1 and 2) show a camel with a blanket and calabash. This is a heavy and large metal object: 4 men were needed to carry it. From 1982 to 2013, it was in one of the author's apartments. A few details on the history of the object will follow. How did it come to be in his possession? 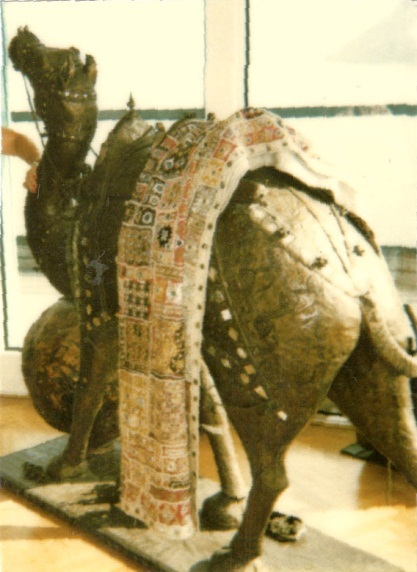 In 1982, this "weighty" object ended up for 31 years in an apartment of the author's abroad from where it was moved to the house of a friend. If the true owner or any of his heirs should read this chapter, they are welcome to get in touch to arrange for pick-up. At the time, it had been his Arab friend's wish that no one should learn his home address. 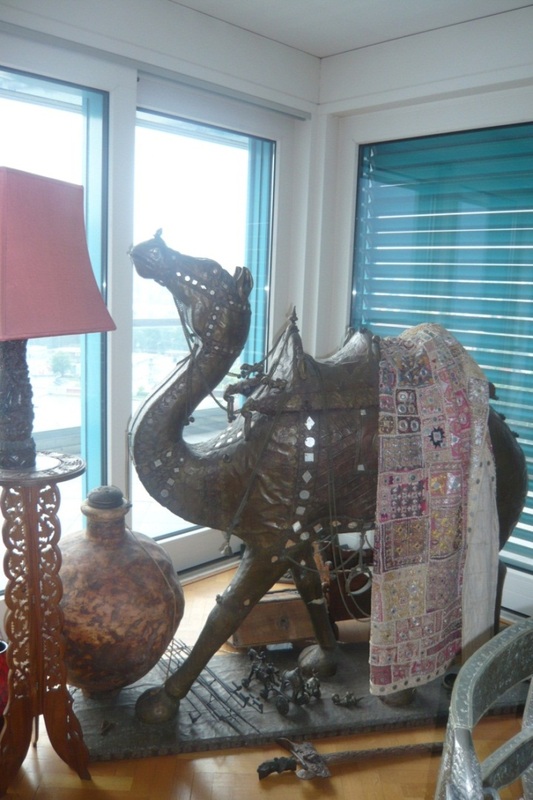 The present "custodian" of this beautiful object is aware of the ownership: "Camel, on loan". Once again, politics thwarted good intentions! 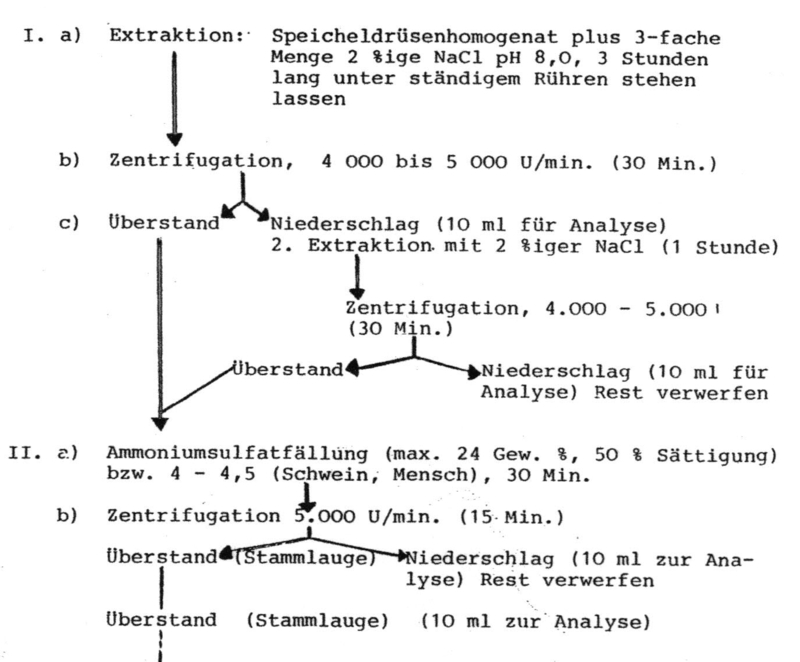 The above-mentioned STASI (state police of the GDR) operation against the Arab medical student brings back very mixed memories of the author's life in Berlin(WEST) (until 1989). [For 44 years, there were "three Germanies": the Federal Republic of Germany, the German Democratic Republic and Berlin(WEST/EAST), all separated by the wall (since 1961)]: One objective of the GDR was to destabilise the system of the West German universities by infiltrating agents/troublemakers, thus affecting the quality of teaching with the aim that there would not be raised enough high-ranking scientists and businessmen in West Germany and Berlin(WEST). This scheme of the GDR ran for many years, until 1989 (and was unfortunately successful). Examples: a) After the Berlin University Act (BerlHG) of 1969 came into force, the President of the Free University for 9 years was a man by the name of Greibich[iii] (I) who had infiltrated the FRG together with the student of chemistry Wunderlich (II). The latter - II - who favoured the Western system worked on his dissertation at the author's institute and was able to provide the author with many details of the leftist tendencies of the student of physics I and his intentions. I thought that II was his "friend". 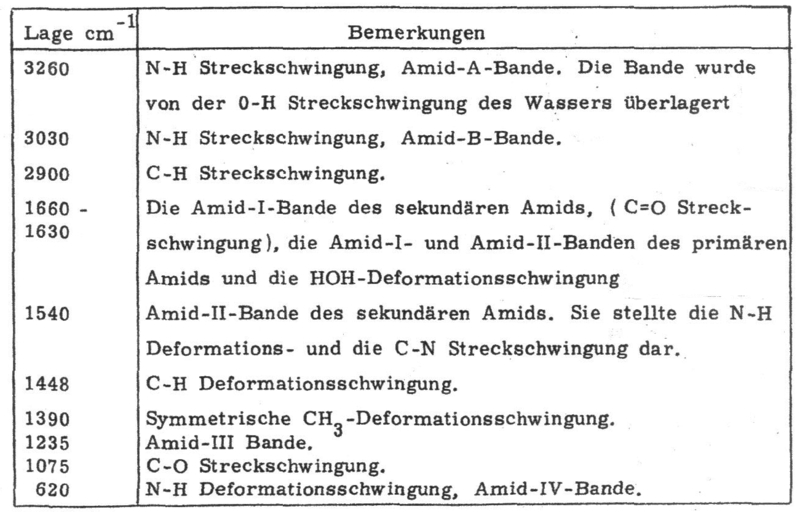 b) Professor Büchi (Part V-A, p 339/40, 346 (12): Documentation Riemschneider/Büchi a-h). The author has not forgotten the harassment people from Berlin(WEST) suffered from the GDR authorities when they had to cross the GDR in transit to West Germany. Everything had to be unpacked and repacked, magazines and books were confiscated, every penny of cash had to be accounted for, mandatory exchange for GDR currency, and extremely fussy time-keeping - not to mention the order to shoot. Only a few of these people were held accountable after the reunification. One should think that the operations of the former GDR ended in 1989, but unfortunately this did not apply to all GDR citizens - as proven by a flyer which the author found in his letterbox. "Why the present German government - headed by two former GDR citizens - manages the enormous flood of refugees in such a way that taxpayers have to contribute billions of Euros, while seemingly ignoring the consequences - despite many objections (and more than 300 cases of arson). Enormous sums of money had already been burned for Greece, and no end is in sight. The 86 billion Euros now on the table will vanish in the same channels and will be lost as well." Just read P. Helmers: By Zeus, you Greeks get out, regarding the earlier payments of billions (2012): Part V-A, p 345. The "ANSWER" on the flyer: "Scepticism of many GDR citizens regarding the "incorporation of the GDR by the FRG, i.e. a totally different system, at the time". The world had collapsed for many GDR citizens! The former FRG citizens are to be taught a lesson through foreign infiltration in such numbers that the old FRG will no longer be recognisable. The result - both systems will have disappeared. Revenge taken. Germany will be swamped by huge numbers of people of different religions and races, and it is impossible that all of them will find work to earn their keep - just think of the language barrier ". In JUNGE FREIHEIT from Sept. 25, 2015 Thomas Hinz comments on the predicament into which Germany and Europe got by the huge crowd of the Third World people: "Die Kontrolle über die Grenze und den Zugang ins Land bildet die Basis der Souveränität und Staatlichkeit. Wer sie aufgibt, macht sich nach außen hin wehrlos und hebt im Innern Recht und Gesetz auf. In diesem Sinne hat die derzeitige deutsche Kanzlerin einen Putsch gegen die staatliche Ordnung verübt. Der betrifft auch andere Länder, die ungefragt als Transit- oder Zielland herhalten müssen, sowie die EU als Ganzes". A public opinion poll would demonstrate what the German people really want. [ii] cf. 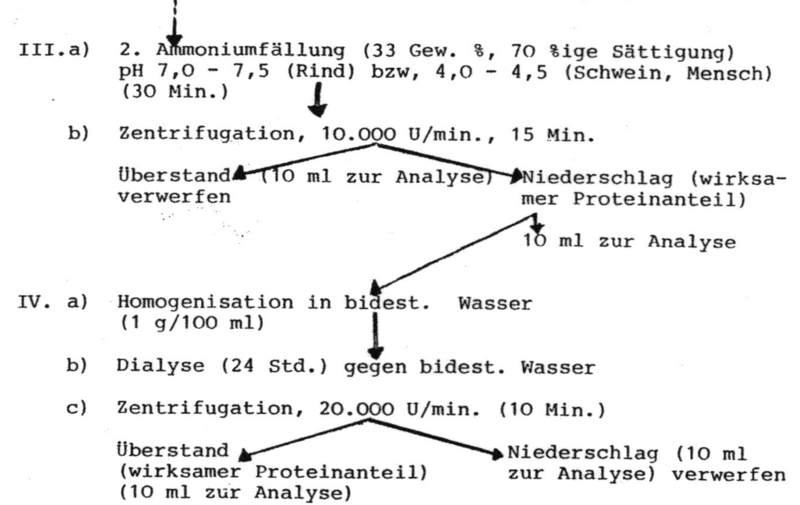 also: R. Riemschneider, lectures of 7 August 1972 and 22 August 1973 at UFSM in S.Maria, RS, Brazil, and at FU Berlin: "NGF Proteins - Isolation and identification from the salivary glands of large animals", manuscript, 93 pages (engl. ); also cf. 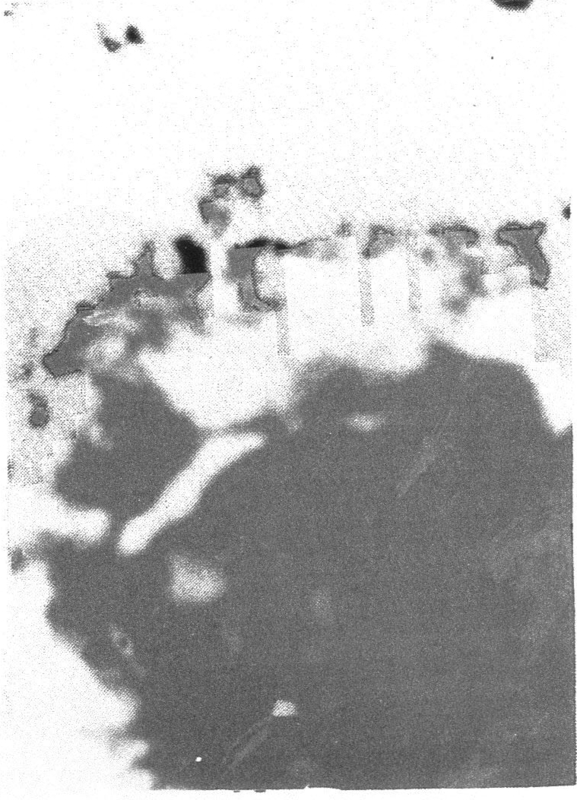 the experimental report FU 21, 1975, p. 133/4.